Paneer is a fresh, firm cheese popular in East Asian cuisine, and Indian in particular, reported to date back as far as 6000 BC. 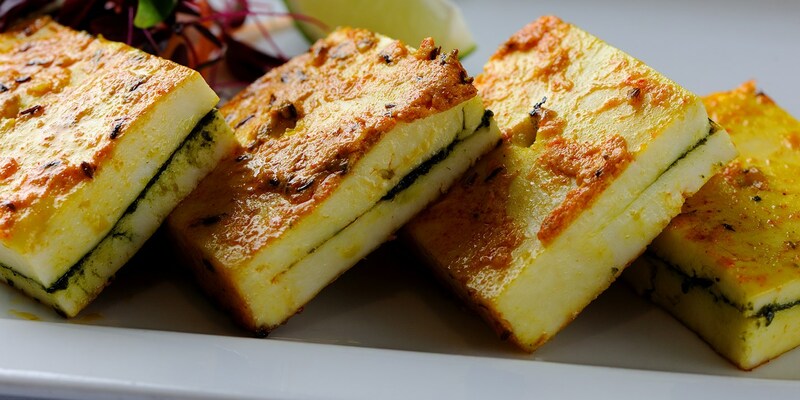 While commonly made at home by simply curdling together a combination of milk and lemon juice, paneer is increasingly available in supermarkets, as well as specialist shops. Due to its firm, non-melting quality and high levels of protein, paneer offers a great vegetarian alternative that even the staunchest of meat-eaters are bound to enjoy. Alfred Prasad’s spiced paneer tikka recipe gives chicken a run for its money, while his marinated Bharwan paneer, stuffed with fragrant mint chutney, makes a fantastic vegetarian starter. Vivek Singh’s paneer and pepper naanza recipe is an Indian twist on the Italian pizza, or for a healthy, filling main dish try Alfred Prasad’s innovative stuffed aubergine rolls, which are packed with quinoa, Indian spices and paneer.